have taken the resolution to live in this cave for the love of my Lord, Jesus Christ. Born of noble blood, descended from Charlemagne, Rosalia entered into hermitude in a cave on Mount Pelligrino, where she died in 1166. Carving her brief story on the cave wall, her story continues five hundred years later, when plague struck the city. Her spirit appearing to a sick woman, and then to a hunter, she revealed to the hunter where her remains were, the relics of her Saintly life, and ordered him to bring them to Palermo and have them carried in procession through the city. Following the apparition and the instructions there given, her remains were carried through the streets of the city three times-and the plague ceased. 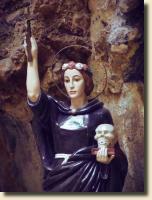 Her salvation of the city caused her to be named the patron Saint of the city, and the cave where her remains were found became a sanctuary. There is an echo of the Seven Sleepers, the People of the Cave who enter the Earth and awaken again to a different world, and here, the Santuzza appears to help the people who live where she once did. It is the waters of Pelligrino, the Mountain itself that awakes her, many say, for she is one with the Land in glorious communion with God. Whether inheritance of the spirits of the Earth, or the result of the devotion of the Little Saint to her Lord, the grace of the Santuzza is celebrated, a powerful ally in the soul’s battle in the trials of this world. The oil is made on her Feast, harnessing the twin powers of proper timing and proper devotion for a novena must be offered for the successful completion of the sacramental. 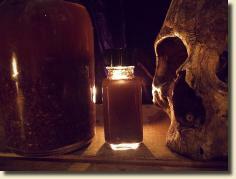 It must always have a base of roses and bone, and be made from quality olive oil. 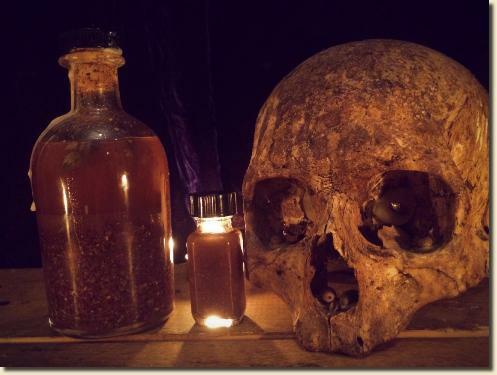 While additional oils and plants may be added during the novena period after her Feast Day, it is the blossom of field and ossuary that truly make her oil blessed. The oil may be used for grace and courage in the face of danger and death, for guarding against disease and epidemic, for visions of guidance, and to give voice to the Dead through the Saint, and for devotional worship and prayer. CAVEAT: The use of human bone in this oil is felt by many to render one ‘unclean’- that decision is for each Devotee and Pilgrim to agree or disagree. The Roses that blossom from the souls of the Blessed are multifold, and all for the Glory of God through the intercession of the Santuzza herself. Price is for one half ounce bottle of the Oil of Saint Rosalia. If you are interested in greater amounts, please contact us.